The use of the phrase ‘learn to swim’ means different things to different people in the UAE at different stages in a person life. You would first teach water familiarization, water safety and then learn to swim using different strokes. Most babies will only be able to be taught water familiarisation and water safety as they don’t have the muscle co-ordination to do strokes, but they have the co-ordination to get them to roll on their backs or kick to the wall. Why is it important for children as early as a few months old to learn to swim in Abu Dhabi? It’s important for a child to learn to swim (water familiarization) at a few months old, as the sooner a child becomes familiar with water the more they can develop water confidence, which can lead to water safety skills and later the development of basic swimming, through play, exploration and encouragement. What’s the ideal stage (how many months old) for babies to be taught how to swim and why? 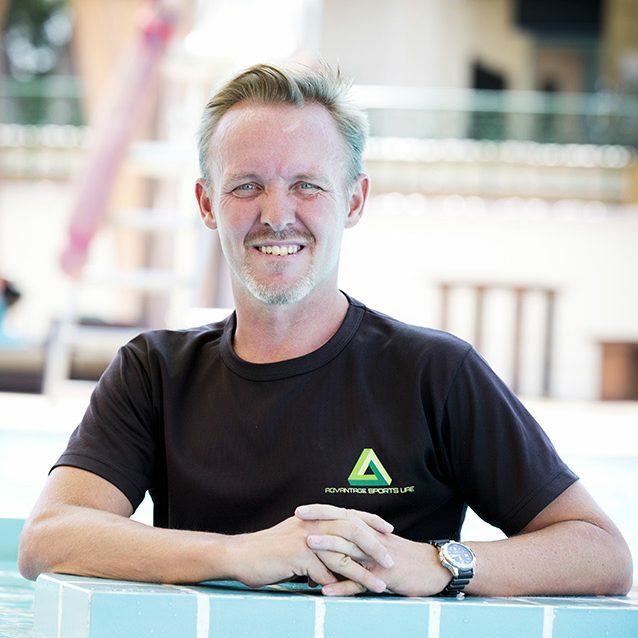 In my opinion as a professional swim coach in the UAE I think the ideal stage for babies to be taught how to swim (water safety) is at 12 to 14 months as that is the time when a baby has started walking and exploring their surroundings as well as can understand the basic wording that will be used in a class. What one needs to remember is each child experience in water is different, so some might be happy being in the water on their backs and some might still be crying. As a swimming instructor, is it easy to teach babies the basics of swimming? To teach a baby the basics of swimming is hard, babies (6-15 months) concentration doesn’t last long; so you constantly need to keep the baby’s attention by changing activities. They don’t have the co-ordination to do the arm movements and kick at the same time. And at this stage the parent is in the water with the child; which makes it challenging as you not teaching only the baby but you also teaching the parent at the same time. Babies or toddlers (16-24 months) concentration is longer, they can understand a few more words and they have got little co-ordination to start do arm and leg movement together, parents are also in the water with them so you to are teaching them. From about two to two and a half years and on, if they are familiar with the water and basic water safety the process of teaching the basics of swimming will start as at this stage their co-ordination is better, and you are dealing with the child as the parent does not have to be in the water with them. How about the challenges of teaching babies the basics of swimming? The challenges of teaching babies of all ages is their previous interaction with water before they start lessons, so if they had a bad water experience either in the bath or pool this will make them scared of water. They can sense if their parent or parents are afraid of water they will to become afraid. Another is when a parent doesn’t want to wet their faces in the bath cause the first time the child face got wet it cried so from then on the parent doesn’t allow water to get near the face. With these challenges as a teacher you will pick up something has happened and try gain trust with parent and baby so they feel safe. As a teacher having the parents, babies, students or pupils trust you, will allow them to be comfortable with you and then in turn, they will learn faster. Can you give us an idea on how swimming trainers in the UAE teach babies? In your class of babies safety is key. The class would consist of singing songs and playing games. This is done so you keeping the little ones attention, and that they don’t realize that they are being taught something. There is also a lot of repartition done so if anything bad to happen, it will be a natural reaction for them to get to safety, so you end up singing Humpty Dumpty five times in a class. As for UAE teens, why is it important for them to learn how to swim? Swimming is a life skill and every one should know how to swim even if it’s just so they can keep their heads out the water or even get to safety if anything bad should happen to them if they are around water. With teens learning or knowing how to swim it is the start of a healthier life style for them, it’s a form of a stress relief when it comes to writing exams and loads of school work. With them doing swimming or any other sport it helps them with time management, it teachers them discipline. If they get an opportunity to learn how to swim, they should take it. I have taught many adults to swim and they all have told me that they wished they learnt when they were young, as the older you get the harder it is to learn how to swim. What are the challenges of teaching teens how to swim? The challenges with teaching teens how to swim is also their previous experience in water (If they have a fear for the water- you need to find out how come? If they weren’t given good instructions on swimming techniques- you have to correct that). Some teens have got attitude and think they know everything there is to know about swimming. Remember earlier I said the older you get the harder it is to learn how to swim, Some teens give up to easily as they can’t get it the first time. Obviously fear of water and drowning is the top concern. But, based on your experience, what are the other factors that make it difficult for them to learn? The first thing you need to learn in swimming is blowing bubbles under water. When you young blowing bubbles comes easy for you so when you add the next component of the stroke its easy, when you get to teen and adult you battle to multitask, so it sounds easier than putting it in to practice. With them being older and taller and it’s the same with adults, is that if they find its too hard or tiring they will just stand in the pool in the shallow side cause they can. Also older you are the more fear and bad habits set in than the longer it will take to fix them. Another factor that makes it hard for them to learn is that if they haven’t played any sport previously their hand eye coordination and their body in space or the way they control the movement in water needs to be learnt and that can take time to fix. Mind sharing some basic swimming for those wanting to learn to swim in Abu Dhabi or Dubai? When swimming try relax and don’t over think your stroke. When an instructor gives advice on your stroke it sounds easy. When you try it, it hard, but in your mind it still sounds easy. Then you start over thinking what you should be doing, start making more mistakes, get tense, make more mishaps, then get angry with yourself. By now you are so tense you forget what you needed to do. All you need to do is relax. You move faster through the water by pull the water hard, not moving your arms fast. 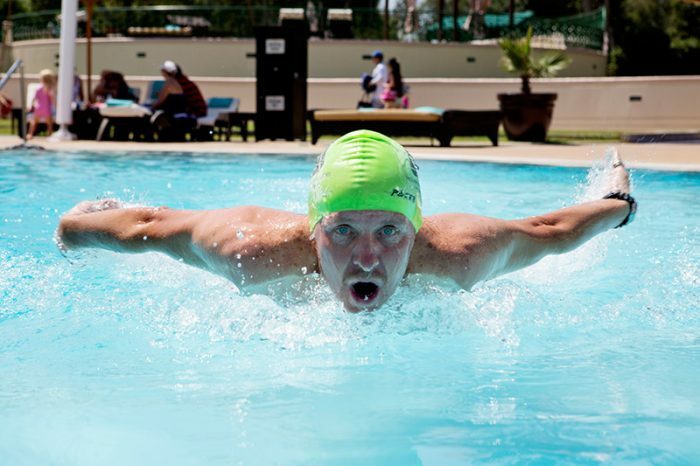 Get into the habit of counting your arms in the pool, the least amount of arms you use to get across the pool the more efficient you are in the water, the harder you will be pulling the water. While swimming make your body as long in the water as you can and try and get to the streamline body position. In swimming there is a drill called catch-up. This drill gets you to pull the water harder, gets your body in the right position, makes you start to even kick. This drill will then help you to do less arms across the pool. Get your thumb to touch your leg. The most important part of your stroke is the end phase known as the push phase. To make sure you are finishing your stroke correctly just before your hand comes out of the water with a long arm, get your thumb to touch your leg before your arm stretches forward again. Swim quietly. When swimming try imagine that there is a shark and for the shark not to find and attack you swim quietly. If you slap the water as your hand comes into the water, you are going to create bubbles by your hands. The bubbles add to and to unwanted water turbulence, which slows you down (I am speaking about milliseconds, but every little helps).